Even if you haven’t got room for a vegetable plot in the garden, there’s no reason to give up the idea of growing your own veg. You can plant up containers with anything from salad leaves to potatoes. Because they are grown in compost and kept well-watered, the crops grow quickly to produce clean, tender crops. You can turn your patio or balcony into a potager! For most veg, choose pots at least 25cm in diameter, containing about 10 litres of compost. Potatoes, and larger plants such as courgettes, squash and sweet corn are better in containers of at least 20 litres. Plastic pots are easiest to look after, but glazed pots are more attractive. If you choose terracotta, paint the inner surface with waterproof paint or line with plastic to reduce moisture loss. Fill pots with multi-purpose compost (or the contents of a growing bag to save money). Sow carrots, salad crops or chard straight into the pot and cover with compost. Most other vegetables can be bought as young plants from a garden centre. With potatoes, one tuber per 20-litre pot is sufficient. Half fill the container and bury the tuber. As the plant grows, add more compost regularly until the container is full. Water the containers regularly. The compost should be uniformly moist but not wet. Feed fruiting crops such as aubergines, cucumbers, courgettes and tomatoes with a flower or tomato fertilizer. Root or leafy crops may not need feeding, but if they look hungry or yellow, give them a dose of a general-purpose fertilizer. 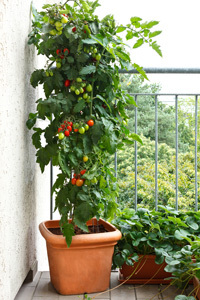 Tomatoes – These work well in a sunny spot on the patio or balcony. Choose a naturally compact variety or train a cordon variety to keep it compact. Baby-leaf Salad – Baby salad leaves are the quickest and most satisfying of all container crops. Learn more about growing baby-leaves here. Cucumbers – These are untidy plants, but if well fed and watered will crop constantly. Buy a small-fruited outdoor variety from the garden centre. Potatoes – In a sheltered spot you can have new potatoes early in summer or waxy salad varieties later. To harvest, simply tip out the pot. Carrots – These are surprisingly easy to grow in pots. They push each other apart as the grow. Pull early as baby carrots or leave until they fill the pot.